Yesterday we went roller skating. 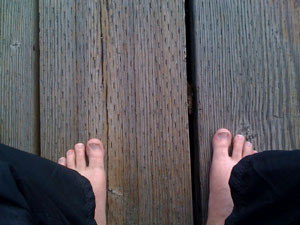 It was a crisp late summer day, and as she skated farther, I spent a lovely time resting on a dock, barefoot. Thanks to E3E for the recommendation on the Runner’s World forums. When bad rears it’s ugly head, here at Spacetrawler it’s our core philosophy: RUN. Run like hell. 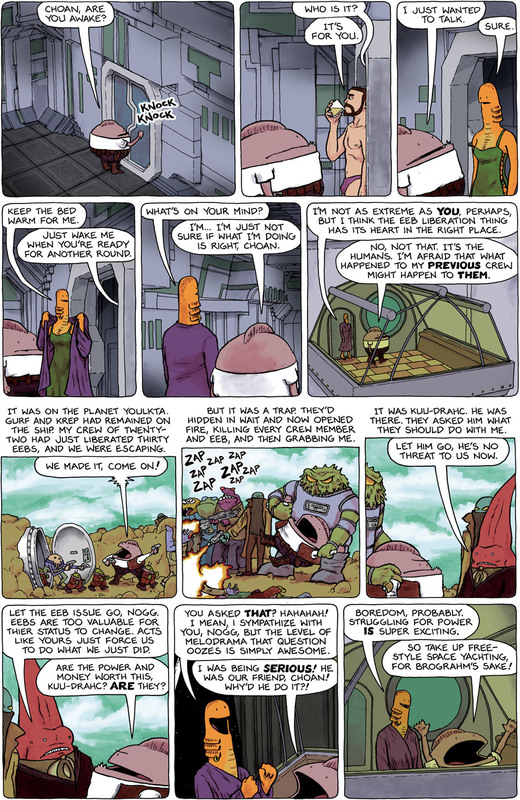 Now I just have to figure out how to weave “free-style space yachting” into the comic. I am totally in love with Nogg’s very Han Solo-y vest! I have to agree there, and Nogg as a space pirate/smuggler does have a certain attraction! Kuu-draahc says “thier” instead of “their” when talking about the Eebs, though. @JKCarrol, it was fun figuring out what the young Kuu-Drahc would look like, and that I felt Choan and Nogg wouldn’t look much different. Thanks, @Sardtok! I’ve been working too long hours, that’s two spelling errors in a row! Will fix as soon as I get a moment. The gravity between rocks on the rings of Saturn would not be substantial enough to force a ship. However, solar winds may be a viable natural propellant. You would need to be awfully close to the star and have some incredible safety technology to make that work. Of course if the stars gravity overpowers the solar wind, I can’t imagine this being anything but a 1 way trip. Meh, stupid idea but I wrote too much to just delete it. Now right out of “Futurama” since the previous crew met with a mysterious and terrible and funny demise. Man alive I totally love Choan’s brutal honesty. It’s like she’s naive and wise all in one sitting; an orange Forest Gump, mayhaps? Hmm Nu and an earthworm now.